Networking is a crucial part of business. Some people love it, some hate it and others are somewhere in between. I’ve always loved it, though still find it challenging. Even more so now that I’m living in a country where I don’t speak the native language too well! Boerenkool met Bubbels is an annual networking event in Delft, The Netherlands that I attended in 2013 and now in 2014. In Australia, I regularly attended a number of networking groups and enjoyed often being asked to speak for the groups on social media. In The Netherlands, it’s a whole new experience – to network in another language. I certainly won’t be the guest speaker in Dutch in the near future, though after many years of practice, I’m pleased to say I can at least hold a conversation in Dutch now. Almost all Dutch people speak English quite well, and often switch to English as soon as they hear my accent. I’m keen to practice my Dutch where-ever possible though so ask if we can continue in Dutch. I do already attend a number of English-speaking networking groups in The Hague and Delft including Connecting Women, Women’s Business Initiative International and my own group, Professional Parents. 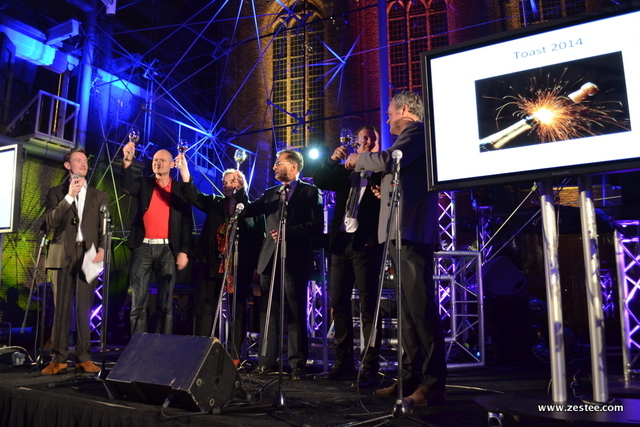 However I also make a conscious effort to attend Dutch events as well and after enjoying the Boerenkool met Bubbels event in Delft in 2013, I was also keen to attend in 2014. Ondernemend Delft brings together all the individual business organisations in Delft and organises this annual event and also undertakes a number of other initiatives to stimulate business and tourism in this beautiful, historic city. They’ve created a “Manifest Delft” document which details this – interesting if you can read Dutch, and if you can’t you can still get an idea from the pictures. Unfortunately, I really wasn’t feeling well on the day of the event, but still made it for a quick look around and the speeches. There was some lovely music when I arrived (I’ll link to the singer if I can find out her name) and the setting was stunning. Held in a function room to the side of the Prinsenhof Museum, the glass walls gave a great view. 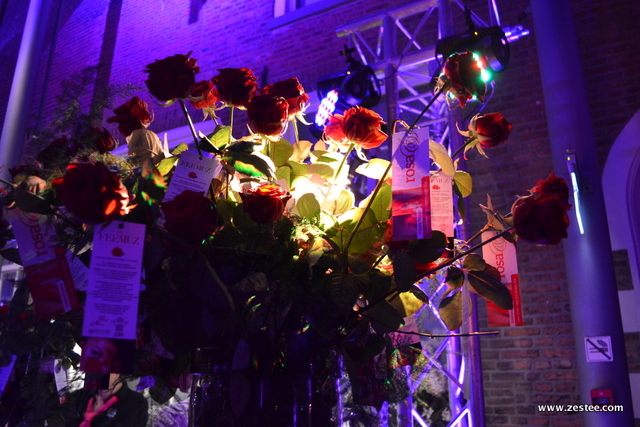 The atmosphere was great, and there were lots of beautiful touches such as roses everywhere and we were all given one to take home, which was a clever way to promote a Valentine’s Day event at three local restaurants: Moodz Delft, Restaurant Le Marriage and Bistro De Pijpenla. 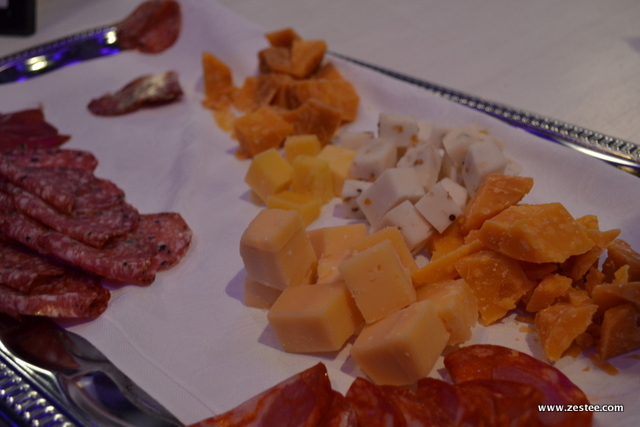 Being a Dutch event, there was of course cheese! There was also some amazing food and, like at the 2013 event, there were some really creative ways of presenting it – unfortunately I didn’t get photos this year, but was delicious. For those who aren’t Dutch, you may be wondering what the term “boerenkool” means – I think it actually translates as kale, and it’s used in a traditional winter mashes potato dish, so that, of course, was on the menu. (and the bubbels means champagne to toast the new year). There was a short presentation by Joris Kleinveld & Michiel Kraaijeveld about the work of the Ondernemend Delft Organisation throughout the year. I found it really disappointing that a lot of people in the crowd continued to talk through the presentation! Then, we raised our glasses (and I raised my camera) to welcome 2014. After the networking event, those with a ticket could party on with the Feemuz event, which is a regular classy evening out in Delft – hope to attend the next one on 21st March. A big thanks to the organisers, it was a great evening.